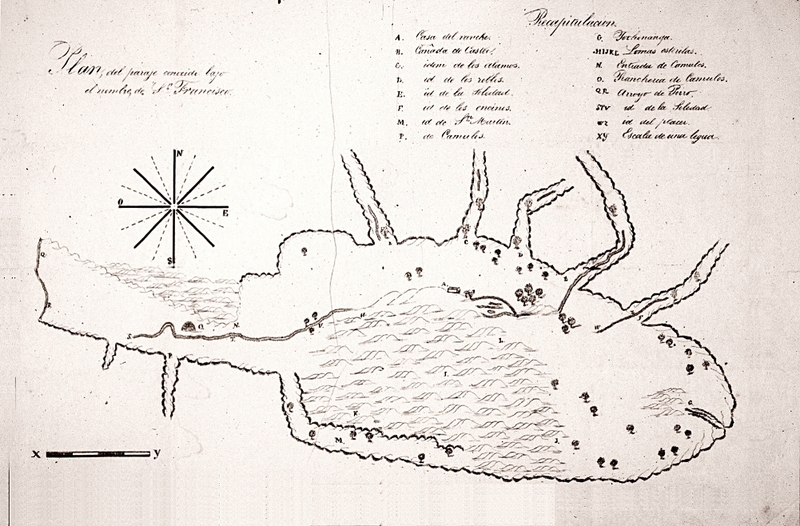 Diseño (plan map) of the Rancho San Francisco, ca. 1843. The map shows the rancho, which comprises most of the Santa Clarita Valley, as it was known to exist when it was owned by the heirs of Antonio del Valle. It had been granted in 1839 to Antonio, who had been using it since 1824 to graze cattle. Landowners during the Spanish and (especially) Mexican period — most land was granted to private owners after the ex-mission lands were secularized in 1833 — were required to file a diseño showing the natural features, major structures and approximate boundaries of the land they owned. This map shows some of the ancient villages once occupied by the Tataviam Indians (most were abandoned by 1803 as the Tataviam were brought to the Mission San Fernando); as well as other local points of interest and the ranch headquarters. Camulos is at left in the "panhandle" area down the Santa Clara River; the old estancia, which the Del Valles used as their ranch home, is at the upper center of the oval area. Offshoots at the top are the various canyons and tributaries  probably (from left to right) Castaic, San Francisquito or Bouquet, Mint, Soledad and Placerita, with the Newhall and/or Elsmere Creek at bottom right.